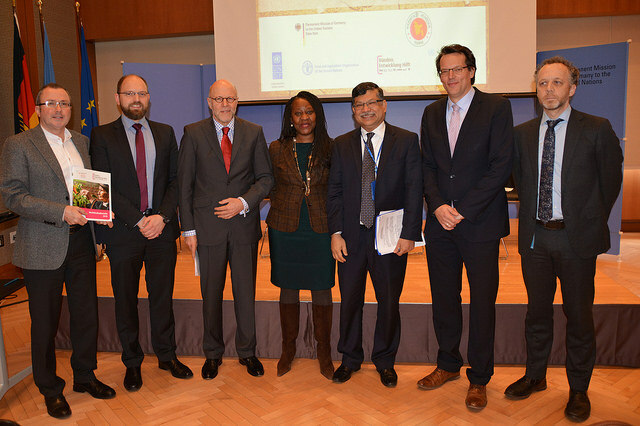 The World Risk Report 2015 was presented at the German House in New York on 26 February 2016. The event was opened by H.E Ambassador Harald Braun, Permanent Representative of Germany and H.E. Ambassador Masud Bin Momen, Permanent Representative of Bangladesh. The high level event was attended by more than 100 diplomats, UN officials and scientists. What is the connection between food security and disaster risk? This question is the central focus of the World Risk Report 2015 by the Alliance Development Works (Bündnis Entwicklung Hilft – Gemeinsam für Menschen in Not e.V.) and the United Nations University Institute for Environment and Human Security (UNU-EHS). Dr. Matthias Garschagen, Head of the Vulnerability Assessment, Risk Management and Adaptive Planning (VARMAP) section at UNU-EHS and Scientific Director of the World Risk Report and Mr. Peter Mucke, Director of Bündnis Entwicklung Hilft, Germany, and Managing Director of the World Risk Report were present in New York for the presentation and panel discussion. The report places food security within the context of the World Risk Index. The World Risk Index evaluates the exposure to natural hazards faced by 171 countries and assesses the inherent vulnerability in the countries towards suffering from impacts when faced with these hazards. The World Risk Index was developed by Prof. Jörn Birkmann from the University of Stuttgart, who was also present at the presentation in New York. The World Risk Report 2015 clearly shows that hunger and food insecurity have negative effects on disaster risks because they significantly increase a country’s vulnerability to natural hazards. Moreover, Dr. Garschagen stressed that the report clearly shows that hunger and food insecurity have negative effects on disaster risks and that disasters might increase food insecurity. Floods or cyclone events, for example, often do not only destroy harvests and granaries; they also destroy transportation infrastructure and lifelines, which hampers the provision of supplies to crisis regions. Not only do disasters often have devastating consequences for a country’s food situation but food insecurity conversely also raises disaster risk. Therefore, disaster risk reduction and food security need to be considered as interlocking issues which need to be tackled in their connectivity: The zero hunger goal in the SDGs will not be achievable globally with high levels of disaster risk. Similarly, the goals of the Sendai Framework for Disaster Risk Reduction cannot be met as long as high food insecurity can turn hazard events into deep disaster crises. The report also shows that Vanuatu is the country with the highest disaster risk (Index value: 36.72) among the 171 countries covered by the World Risk Index 2015. Tonga, ranked 2nd (Index value: 28.45), and the Philippines, ranked 3rd (Index value: 27.98) have switched positions in comparison to last year. Whereas Tonga shows an increase in the lack of adaptive capacities, the Philippines has managed to slightly improve its adaptive capacities and reduce its level of susceptibility. Additionally, the World Risk Report 2015 establishes a very urgent need for action to achieve better food security in Bangladesh, Burundi, Guinea-Bissau, Haiti, Cambodia, Cameroon, Madagascar, Niger, Senegal, Sierra Leone, Zimbabwe, Timor-Leste, and Chad, all of which are severely threatened by extreme natural events. To read more about the key results and recommendations for action, download the complete World Risk Report 2015. Download the World Risk Report 2015 factsheet. Printable images, infographics and maps can be provided upon request. Printed version of the WorldRiskReport 2015 and former issues can be requested via e-mail to: presse@entwicklung-hilft.de.